Juxtaposing different textures isn't just restricted to clothes and accessories, I decided to give the matte polish look a spin. Mixing matte and glossy polish is actually slightly harder than I had expected. 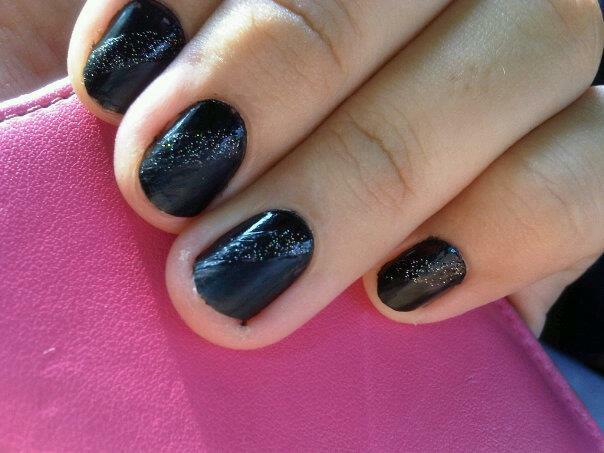 I decided to do a black manicure with half of the nail matte and half of the nail glossy. I used China Glaze matte topcoat along with Black Lingerie from Revlon. I applied the glossy polish first, and after two coats, I swiped on the matte top coat diagonally. It was hard to get a straight line! The half was not too nice and even, so I covered up the botched polish with China Glaze glitter polish along the supposed demarcation. Overall, I like the look, but the matte top coat was not as "matte" as I expected. I was hoping that it would give a more coarse, dry finish, but instead it made the original polish just a wee bit duller and paler. I saw many different designs online, with crazy zig-zag patterns. I must say those are way beyond my league, and I'll stick to perfecting simple designs before launching into more complex patterns!